As the temperature dips and landscapes get a bit greener (and I see just how much weight I’ve gained over the holidays), I often find myself hunting for nice day hikes around the UAE and Oman at the start of a new year. So far this year, I’ve taken on two. In previous years, I’d head out to a location, drive around for a bit, maybe kinda-sorta find the hiking location but all too often, it would end up cut short due to lack of proper direction or simply reaching a dead end. Now that I have a Garmin GPS device (frustrating though it may be to set up) from when we trekked Turkey last year, it’s helped immensely in actually being able to locate and follow certain walks. interesting little stone structures on the mountainside at Wadi Shah – for shepherds? First, we headed to Wadi Shah in Ras Al Khaimah (near Jebel Al Jais) for a walk through and then up and out of a wadi to a mountainside. (Details and GPS coordinates can be found here.) I have to admit, this was not one of my favorite walks. I really like to see some greenery, some pools of water (I know, I know, big ask in this region, but you do come across it more often than you may expect in the mountainous areas) – you know, anything that makes the location I’m walking through look pleasantly habitable. There was one patch of trees to be seen, from what appeared to be a small ex-date palm farm. It was sheer, beige walls and red, rocky mountainsides as far as the eye could see. The boyfriend called the scenery dramatic and beautiful; I called it a desolate moonscape. One of the unique things about this hike is that there actually was a walking path to follow (for the most part; it did disappear from time to time). We’ve done a fair share of exploring around the country, but following an actual path was a first for us. I’m sure there are plenty more out there, but I think you need to know where to look. We didn’t do the entire route (I woke up late, then got all worn out trying to find our way up the mountainside to the first village – one area where we lost the path), so we turned around after the “village 1” mentioned in the link. I think this is where the walk would have started getting nice as well. The mountain village was interesting, with terraced fields (just dried mud when we were there but perhaps nicer after the seasonal rains start) and I would be interested to come back again before summer hits (and as we headed back down the mountainside into the wadi, I think we found the path we should have followed up, making the next try easier there). The following weekend, I made sure to find a greener, wetter walking location. This brought us to Jebel Hatta. (Details and GPS coordinates can be found here.) With no intention of pulling off the entire hike covered in the link (I think that would have to be an overnight camping trip), we went as far as “pool 2” mentioned in the itinerary. I absolutely loved this walk. Winding through a wadi towards Jebel Hatta, it’s not too strenuous with a very gradual ascent – the most difficult bit about it is that the wadi bed is never quite flat and you’re always stepping over, on and around various sized gravel, stones and boulders (some of which are loose, so beware). Starting from a local farm – a very verdant one, at that – the early bit of the walk is nothing too exceptional. Again, I think later in the winter/spring season, it would probably be a bit greener with more pools – even small springs – peppering the wadi floor from the get-go. 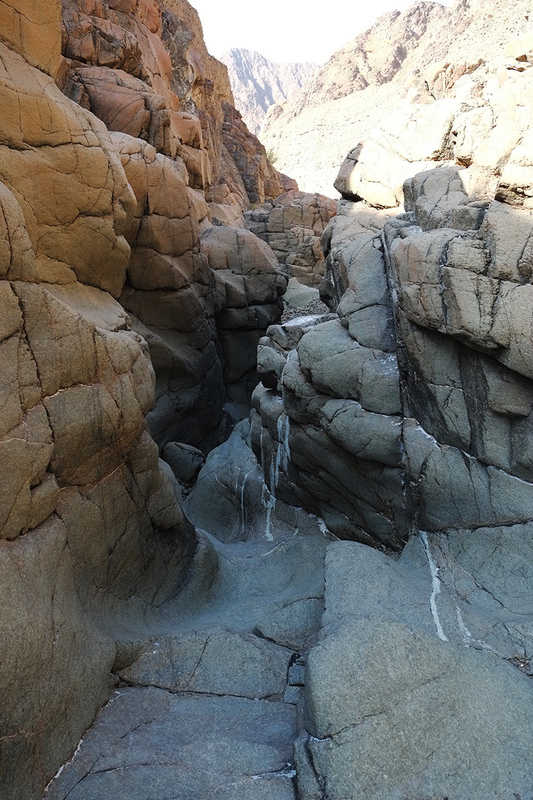 If you do this walk, be prepared for a bit of clambering – through dry waterfalls and up and out of, then back into, the wadi when there is a waterfall you just can’t climb up or a pool that you can’t get around. As incredible as this area must be after a good rainfall (although I wouldn’t advise trying to go if you think there’s any chance of rain whatsoever), I can only imagine that would make the hike far more difficult – the more pools and waterfalls, the more you’ll have to climb in and out of the wadi to get around them. The pools that were there were apparently rather small. You could see watermarks very clearly far above the pools’ current heights, giving some idea of just how wet this area must get during the rainy season. But still, frogs and veritable jungles of plant life (pampas grass?) twice as tall as we were populated the landscape. One interesting part of the walk pertains specifically to this towering grass: in a number of sections, it had burned to ash on the ground. An accidental fire or lightening strike (but I’d be surprised at the latter in a wadi)? Do the local farmers come and burn it purposefully – although I can’t imagine why. It’s all located far enough away from the farms that I don’t see why it would be a nuisance to them? If anyone reading this can shed light on that little mystery, I’d love to hear it. And in a few days, I’ll be trading in rocky wadi floors for the Swiss Alps’ snowy mountain peaks. Fondue, apple fritters, raclette and gluhwein, watch out because I am coming for you! Big time. Swiss franc that just got a lot stronger against the US dollar (and so the UAE dirham as well) – I am not coming for you. In fact, I am very unhappy with your behavior at the moment. Thank you for these blog. I would like to know if you can do these 2 hiking (UAE) without guide? Did you have a map to know the way? I did not hire a guide, but a map is necessary. As mentioned in the blog, I plugged in the GPS coordinates (coordinates and details can be downloaded in the links in the copy) and followed that. I think it would be difficult without the GPS coordinates.